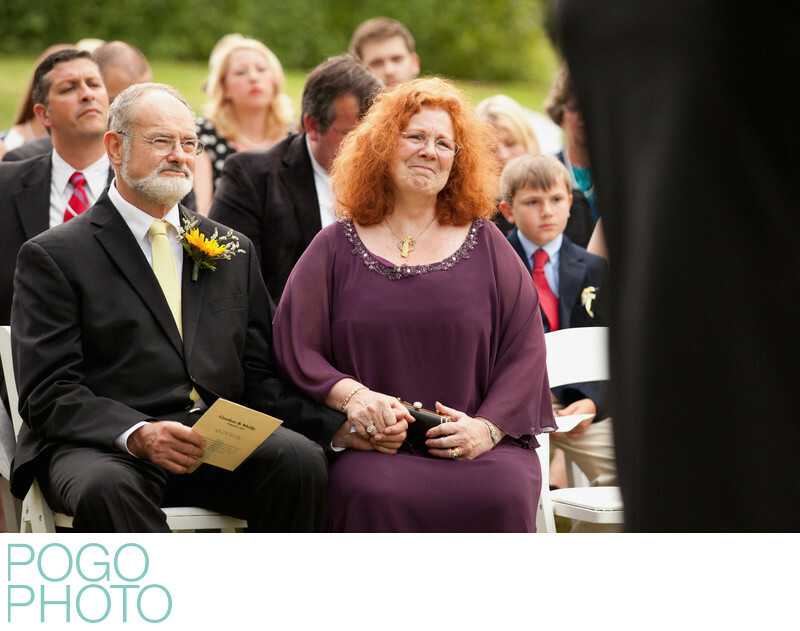 Beautiful country weddings in New Hampshire may seem picture perfect, but it's really emotional moments with the bride's proud parents that make our hearts sing. That's not to say that this lovely outdoor ceremony wasn't enough for us artistically; the lush green background, the duck pond, and the rustic family owned inn all make for an idyllic wedding weekend, particularly if it's a group destination wedding to the Upper Valley area. This image is purely documentary: the clasped hands, the light hold on the wedding’s program, the tears of joy that threaten on her face, and the hint of the groom’s jacket in the foreground all call to mind an emotional scene as their baby girl gets ready to marry the man of her dreams. Couples getting married at Dowds’ Country Inn on the green in Lyme, New Hampshire, have a picturesque and quintessentially New England location for their wedding, just steps away from Dartmouth College, Hanover, and the mountains of Vermont. Summers in the Upper Valley tend to be warm during the day and cool at night, with crystal clear night skies, occasional rainstorms, and hot sunshine on most afternoons. Having an airtight rain plan is a must, but we tend to get very lucky on weekends in the summer. 1/400; f/3.5; ISO 400; 160.0 mm.